This is a nourishing breakfast with the added amaranth grain. When pressed for time, I serve this breakfast cereal with fresh local blueberries during the summer months. When I have more time, I like to add a side dish of scrambled tofu and slice of toast with an organic fruit spread. Place amaranth, water and salt in medium size pot. Bring to a boil, reduce heat and simmer 15 minutes. Add grits and simmer 15 minutes more. 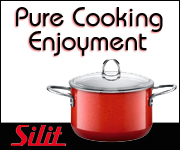 Silit Crazy Yellow Ceramic Cooking Sets and Cook ‘n Serve Pot / Bowl will brighten up your kitchen and cook wholesome organic foods into healthy and delicious meals!